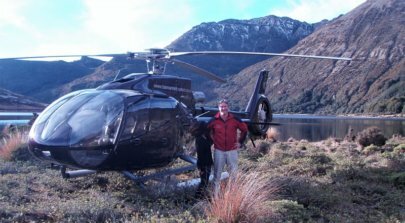 A spectacular must see and do helicopter hike and scenic on the famous Heaphy Track – one of New Zealand’s Great Walks in our second largest National Park. Our most popular and most spectacular hike and walk, featuring a scenic helicopter flight across the rugged expanse of Kahurangi national Park, our second largest, landing on a high, broad mountain ridge near the centre of the park, and also at beautiful Boulder Lake, before flying down to hike on the stunning subtropical lower Heaphy river and the wild sea coast trail of the last day of the Heaphy track. 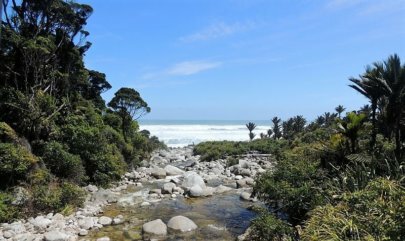 Many people consider the Heaphy Track to be the greatest of New Zealand’s nine Great Walks, combining alpine environments and a primeval, palm fringed coastline. 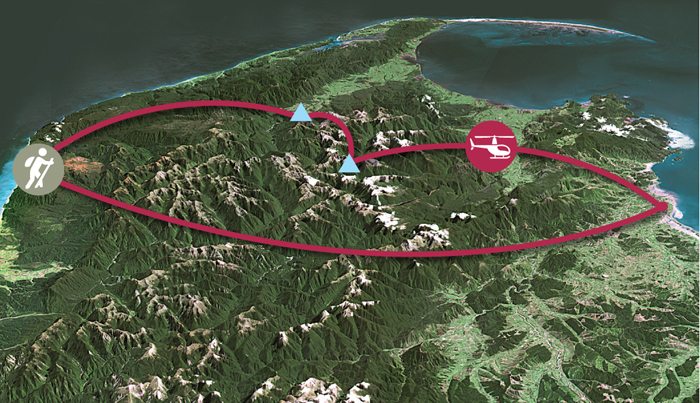 At one million acres, Kahurangi National Park is New Zealand’s second largest, lying in the northwest corner of the South Island, and best known for the 82 kilometres long Heaphy Track, a historic trail which stretches from Golden Bay to Karamea on the West Coast, walked by many visitors each year. Kahurangi means “treasured possession” in Maori, and true to the name, the park offers seclusion and rugged grandeur with its imposing mountain ranges, rolling tussocklands, unspoiled dense forest valleys, and remote and spectacular coastline that together represent the greatest variety of landforms, habitats, plants and animals of any of New Zealand’s National Parks. 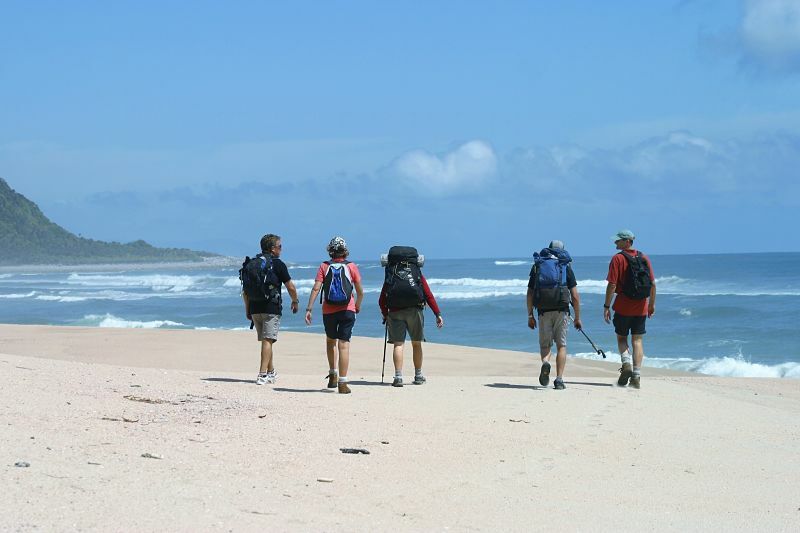 We’ll match the length of the Heaphy helihike to your fitness and preferences. It’s about an hour on the trail of easy walking through giant rata and abundant groves of Nikau forest to the Heaphy hut where we often have lunch, or a further 1 hour 30 minutes to Midpoint on the coast track (we call the helicopter, which waits at the Heaphy hut, then lands on the beach to collect us, or a full 6 hour (17 kilometre) day walking to the end of the track along the coastline to Kohaihai and Karamea, (at extra cost) where we meet the helicopter or fly back by fixed wing plane to Motueka or Nelson. The lower Heaphy area with its towering limestone cliffs, thick subtropical forest and rugged unspoilt coastline featuring long golden sand beaches is a unique and spectacular part of New Zealand that relatively few people get to experience. 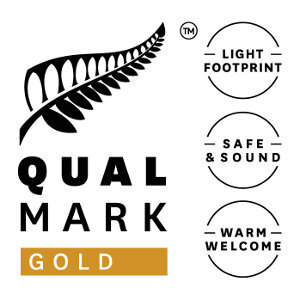 You won’t want to miss it on your New Zealand holiday. 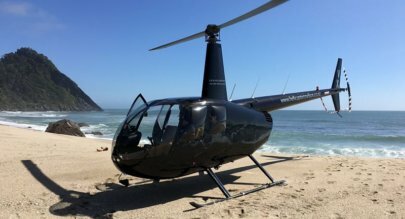 Depending on the length of walk, the return trip by helicopter (at additional cost) can be via the remote north western coastline of Golden Bay to Wharariki beach near Farewell Spit where we land, and Abel Tasman National Park. We can also return via Karamea and the amazing Oparara Arches, also at additional cost. Your Simply Wild guide will collect you from your lodge around 9.30 – 10.00am and transfer you to the helibase by luxury SUV. 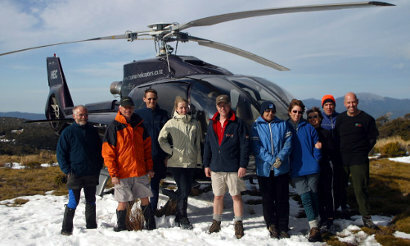 Alternatively we can arrange to fly to your lodge and collect you. After liftoff the helicopter climbs over the eastern edge of the park, crossing the karst, (marble and limestone) Mt Arthur range and Tablelands, before briefly landing on a high alpine tussock ridge above the Cobb River valley, so that you can walk around and appreciate the size and isolated expanse of this section of the park. 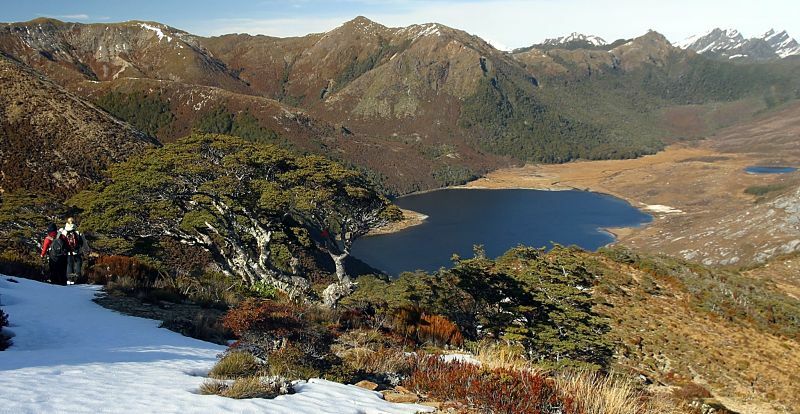 The area is dotted with high mountain lakes and tarns and the stop offers superb 360 degree views of the park. Next you will fly past the rugged Douglas Range and the aptly named Dragons Teeth, a series of craggy and jagged peaks with sheer sides on our way to beautiful Boulder Lake, a glacial lake set high in the mountains beneath 1600 metre peaks. We often stop here for morning tea of coffee, tea and fresh chocolate brownies on the verandah of a rustic and isolated mountain hut. Directly behind the hut is a splendid waterfall with a lovely jade green pool at its base. As you leave, the helicopter skims across the lake before turning tightly beside steep rock faces to view the 60 metre double leap waterfall where the lake stream drops vertically into the valley below. Heading west you will pause beside the unusual limestone formations on Mt Olympus which were the site of filming some of the hobbit scenes in the original Lord of the Rings movie, before descending over the exposed moorland of the Gouland Downs, the main habitat of New Zealand’s great spotted kiwi near the eastern end of the Heaphy Track, then toward the western coastline, the Heaphy River and the landing on the riverbed adjacent to the track. 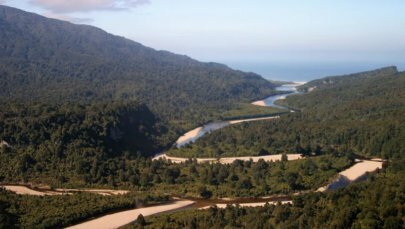 While the helicopter flies on a short distance to the hut to wait for us, we’ll walk the 40 minutes along the track with the languid Heaphy River on our right, and high bushclad limestone cliffs on our left through lovely subtropical forest. High in the forest canopy are huge, gnarled rata trees, which in summer between December and January colour the otherwise green forest and hillside with an array of bright crimson flowers. 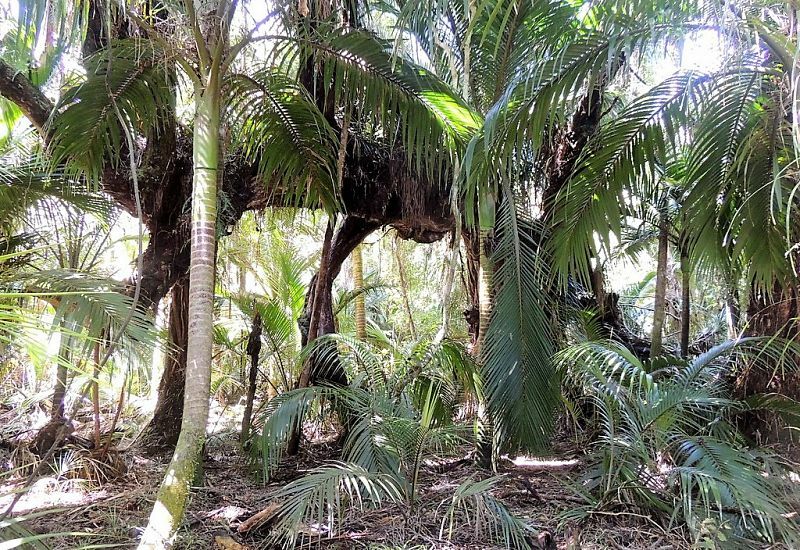 Below the high canopy are dense pockets of New Zealand’s native palm tree, the Nikau. 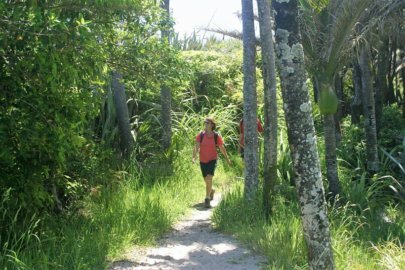 The track is easy walking, and you wander through the forest and unusual layered formations of limestone to the hut near the river mouth and the sea. You’ll hear bellbird and tui and often see curious weka darting through the undergrowth. Arriving at the hut we often have lunch on a log at the driftwood strewn beach, watching the often wild Tasman Sea rolling into the exposed and remote coastline. For those who wish to walk for longer, we can walk two hours further, or all day along the coastline on the coastal track (this is at extra cost as the helicopter must wait all day or our usual option is to fly back from Karamea airfield by fixed wing aircraft) which follows the unspoilt shoreline past rocky points, stands of nikaus and long sweeps of golden sandy beaches, with a mosaic of bushclad hills rising steeply from the sea to our left. At a prearranged time or when we text the pilot, the helicopter, which will have been waiting back at the Heaphy hut, will fly to a small landing spot on a coast beach to collect us for the flight home. 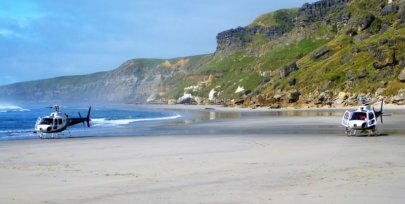 You’ll either head home direct over the Heaphy Track or return via Wharariki beach at Farewell Spit and Abel Tasman National Park. Returning this way is additional cost. The trip is through a wilderness area subject to weather, and we reserve the right to alter the high mountain part of the day if weather requires it. Why should I go on this trip? Kahurangi National Park is one of the most stunning places in New Zealand, covering 500,000 hectares (1 million acres), with a huge variety of landscape, from high mountains to subtropical rainforest and wild and remote coastline. This trip covers all of that in 4 hours to all day depending how much time you wish to spend. Most travellers don’t get to see it in this way. 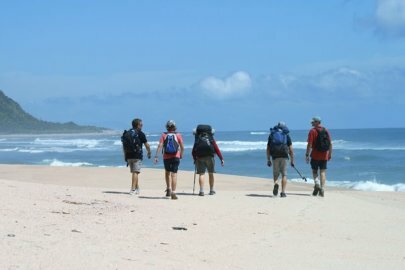 How hard is the walking/hiking and how long is it? The Heaphy Track is one of New Zealand’s Great Walks and is wide and well surfaced. 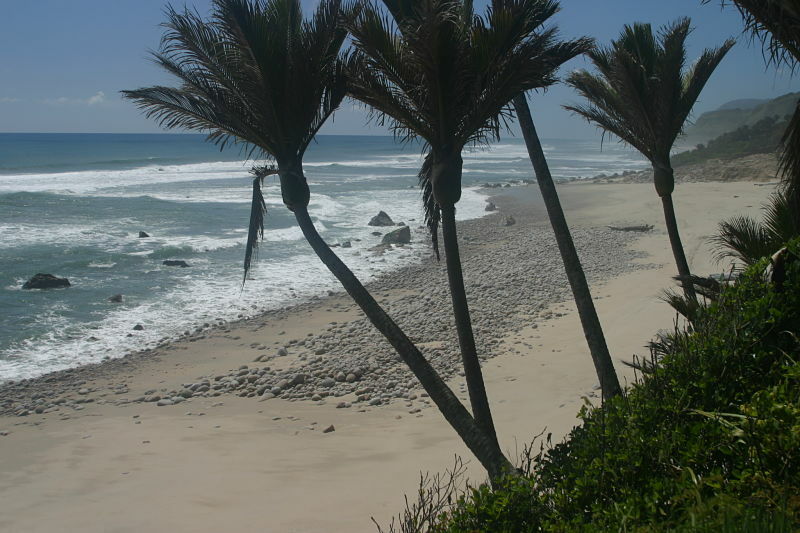 The first 50 minutes is easy walking for almost anybody, through stunning subtropical forest. You can choose to stop there as we will be with the helicopter, or we can walk a further 2 hours to what we call Midpoint down the coastline, where we will arrange for the helicopter to come and collect us, or you can walk to the end of the track near the remote town of Karamea which takes a further 2 hours. 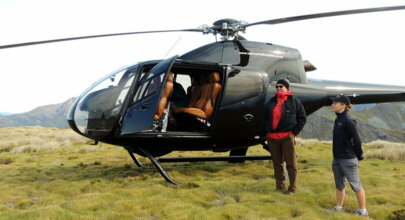 Again the helicopter will collect us for the trip home. What happens if the weather is uncertain? We have run this trip for 11 years. If the weather is uncertain but flyable (windy or cloudy for instance), we will advise you that it is safe, but it may be a bumpy flight and we may not be able to guarantee conditions on the coastline. You will make the final decision to proceed. If we feel the weather is unsafe we will cancel the trip.